'ENORMOUS Changes at the Last Minute" is the title of a very fine short story collection by the late author Grace Paley. The guess here would be that none of the Eagles' defensive linemen has read it, but they probably can relate. A d-line that already has seen coordinator Juan Castillo dispatched in favor of Todd Bowles and 2011 sack leader Jason Babin exiled to the waiver wire (then to an even less desirable locale, Jacksonville), now has a new position coach, Tommy Brasher, who is replacing the fired Jim Washburn. On Wednesday, Brasher began instituting a new style of play. Hey, why not? There's four whole games left in the season. "We went from attacking to basically reading and reacting," defensive tackle Cedric Thornton said after practice. "[Brasher] and coach Wash definitely have some things in common and definitely have a whole bunch of differences. But I like him. I haven't played a game for him yet." The Eagles have not made Brasher, who turns 72 Dec. 30 and has been retired since leaving the same position in 2005, available to reporters yet. So we don't know how hard he thinks it's going to be for players to put aside everything Washburn has been telling them the past two seasons and embrace a totally different philosophy. The change up front also changes the reads and responsibilities of the linebackers and secondary. Ultimately, it might make their jobs easier, particularly against the run, now that the entire defensive line isn't going to be charging blindly upfield at the snap of the ball, but there is a reason why such changes generally are undertaken in the offseason, not in early December. So, were Brasher's new charges shocked when they got the news Monday? "I've been here 2 years. I can tell you that I'm not surprised by a lot of stuff that happens, so I definitely wasn't surprised," Thornton said. "Did I want it to happen? No, but I'm at the end of the totem pole, so I definitely don't have a [say] in that." Thornton, who spent most of 2011 on the practice squad as a rookie out of Southern Arkansas, was a Washburn project who has shown promise. He has heard the mostly anonymously sourced criticism of Washburn over the past few days, the coach portrayed as a contentious man who disrespected colleagues and was only worried about the defensive line and its stats, not about the team or winning. "Do I think he was misunderstood in a lot of stuff that he was trying to do? Yes, I do," Thornton said. "People ask me do I like him. I think that's an understatement. I love coach Wash. He helped me and my family out a lot, and I wish him the best of luck." No player had to work harder to prove himself to Washburn than 2010 first-round pick Brandon Graham, who only recently started getting substantial playing time. Asked about Washburn's manner, Graham said losing takes its toll on everyone. "I know coach Wash was kinda sad because we were always losin', we weren't getting sacks, it just wasn't a good year for a lot of people," Graham said. "I just know he loved his d-line. That's all it was. He just wanted us to do good, you know? He wanted his group to be the best, be the leaders. In some people's eyes, that wasn't looking like a team player, but some of the other stuff, I don't really know about. He helped me a whole lot." Defensive tackle Cullen Jenkins said something similar. Jenkins said the atmosphere Washburn fostered was "no different than with most teams." "Washburn's approach to how to get us fired up, how to get us motivated, and how to get us to play hard, some people take it the wrong way, or looking from the outside in, might not understand it," Jenkins said. Like several Eagles, Graham said he has played read-and-react before, it shouldn't be as hard to switch back to as learning Washburn's hyper-aggressive approach was. "It's something that I've got to dust off, dust the cobwebs off and get ready to go," Graham said. Eagles coach Andy Reid, who reiterated Wednesday that Washburn's dismissal was entirely his idea, continued to avoid discussing his reasons for making the change. But in Reid's description of Brashear and of what he expects from the man who coached the Birds' d-line from 1999 to 2005, there was room to read between the lines. Reid called Brasher "a positive guy, he's upbeat, he's all about the team . . . He wants to help it get better." "I just want him to do what he does," Reid said, when asked what he wants to see Brasher do that Washburn wasn't doing. "What he does, he prepares a good, sound, aggressive defensive line. I think that's what you'll see." Attempts to reach Washburn for comment so far have been unsuccessful. 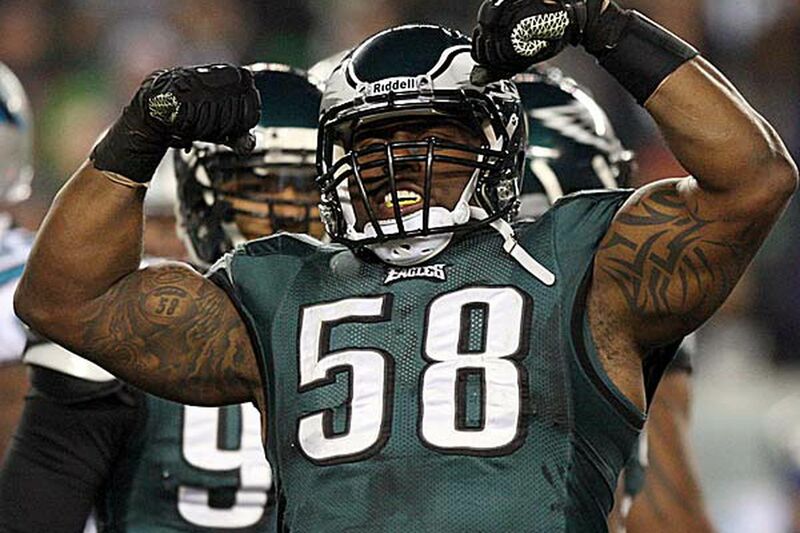 Defensive tackle Mike Patterson and defensive end Trent Cole are the only Eagles who played for Brasher the first time around; both were rookies in 2005. Patterson said Wednesday that teammates were asking him what Brasher was like. "I told them he was a real cool guy," Patterson said. "He got on us. That was my first year, so he was real tough on us. He's good at teaching the technique of what we're doing now." Isn't it chaotic, trying to change methods late in the season? "Normally I would say yes, it is tough, but we have a lot of guys, a lot of experienced guys, that have played within a scheme like that," Patterson said. One starter who has not played read-and-react previously is first-round rookie Fletcher Cox. Mississippi State emphasized getting upfield, just as Washburn did. "With four games left, we only have a couple of days [of practice] left before we play Sunday's game, it's going to be kind of hard trying to adjust," Cox said. "We've just all got to commit to it and get the job done." The other rookie, second-round defensive end Vinny Curry, said while at Marshall he played more of the style Brasher wants. Curry, who said losing Washburn was "definitely a shock," said he thinks he can adjust. "You live and you learn from this," Curry said. "You got role models like coach Reid, for example. Look at everything he's going through. This ain't nothing compared to what he's going through. If he can be strong-minded and stay positive . . . we're going to keep fighting."